Today, in the bright sunshine, I stood on a street corner at 3:55 pm in a gaggle of mothers and fathers and grandmothers, all waiting to greet the young riders of a schoolbus. Like a British train, it was on time, and it lumbered to a halt near us. Its door yawned open to release youthful crossing guards who rumbled down its steps to courageously stand in the street, seeking safety for their peers. Soon there was a big hug about my waist and there stood one of my favorite people in the world, in a red spring coat with dalmatian collar and matching cuffs, an ensemble complete with purple backpack holding scholarly treasures. My sister's child, she is my pal, and soon, hard to believe, will be seven years of age. On the walk home, we talked, as usual, about life and what she had learned in school. I was told a number of things. That a seed is a baby plant, that George Washington Carver invented peanut milk, and that tomorrow Emma's class is going on a field trip. "Oh yeah? Where?" I asked. "To Washington DC," she said proudly. "And what are you going to see there?" I inquired. "The Lincoln Memorial," she told me. "That's where Abraham Lincoln sits in a chair." Inside the house, we too sat in chairs, and I heard more. That Abe wore a tall black hat, and that he was our 16th president. And that his picture was on one side of the penny, and his memorial on the other side. "Abraham Lincoln had a tall black hat. He was our 16th president. He is honest. Honest means you tell the truth. When you tell the truth it makes you and your friends feel better. When something happens I tell Mom the truth because I'm being respectful. 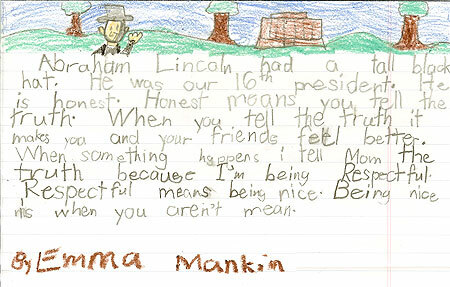 Respectful means being nice. Being nice is when you aren't mean." This is a keeper Mare. Thanks! Emma is one smart young lady. She is someone to be very proud of!